Up in the morning and out to your car to find out that your battery is dead. This is not a pleasant experience. This is especially true if you do not have a battery charger or another vehicle to use to start your car. It is time to call East Coast Towing and get on the road. Our service is undeniably the best in the tri-area. We have courteous, experienced and well-trained drivers and the most up-to-date equipment available. We can get you back on the road quickly and safely. When your car or light truck will not start, it is possible that it is more than a dead battery. Our trained drivers will help to diagnose the problem. If necessary, they will tow your vehicle to the service area of your wishes. 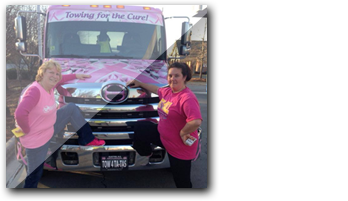 Do not be surprised if they can confirm a diagnosis that will get you back on the road. A flat tire or a blowout is not only inconvenient but also dangerous. If you have a spare tire, our drivers can replace the flat. In the event that there is not a spare available, our drivers may be able to plug your tire and get you on the road. It does not have to be a totally stressful situation. It can be a temporary inconvenience. Did you ever lock your car and turn to leave and realize that the keys were lying on the front seat? Perhaps in your effort to unload the groceries, your keys wound up in the trunk. 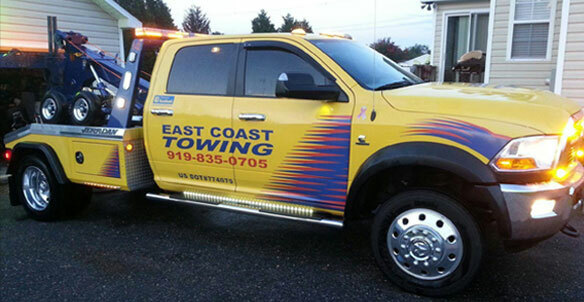 East Coast Towing can get you unlocked and your keys retrieved in minutes. Problem solved. If bad weather hits your area, there can be problems. Snow will cause you to be stuck in a slippery area that cannot be avoided. Perhaps there have been rainstorms that have caused you to be stuck in the mud. Either of these issues can be solved by East Coast towing at any one of our conveniently located branches. We are a phone call away and are here to serve you 24 hours per day, 7 days per week. An accident is very traumatic. It creates stress on many levels. There can be possible injuries, extensive damage to your car or light truck and unplanned for expenses. 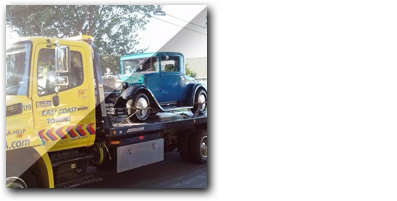 Calling a reputable towing service will make the stress level decrease tremendously. Once you meet one of our courteous, knowledgeable drivers, your mind will be at ease. You will know that your vehicle is in good hands. If you have a car or light truck that has multiple problems and needs repair, we can help. Our tow service will get your vehicle to the repair shop of your choice while offering competitive rates and experienced, courteous service.